24 Kilates x HUMMEL HIVE "Takraw"
In an epic new collaboration, heritage sports and lifestyle brand hummel meets the internationally acclaimed streetwear store 24 Kilates. Created in HUMMEL HIVE, hummel’s hub for premium collaborations, this limited edition drop focuses on 24 Kilates’ other home – Thailand. Inspired by the powerful South East Asian sport Sepak Takraw, the black and gold collection is brought to life by the players from the Thai national team – the best team in the world. As Sepak Takraw – also known as kick volleyball – is a native sport to Southeast Asia that brings a vibrant, powerful and fierce attitude forth, this enticing collaboration centres around hummel’s vast sports heritage and 24 Kilates’ profound curation of modern streetwear. Held entirely in black and gold, the drop presents four stunning designs; two jerseys, shorts, and a version of the classic hummel sneaker, the Marathona. 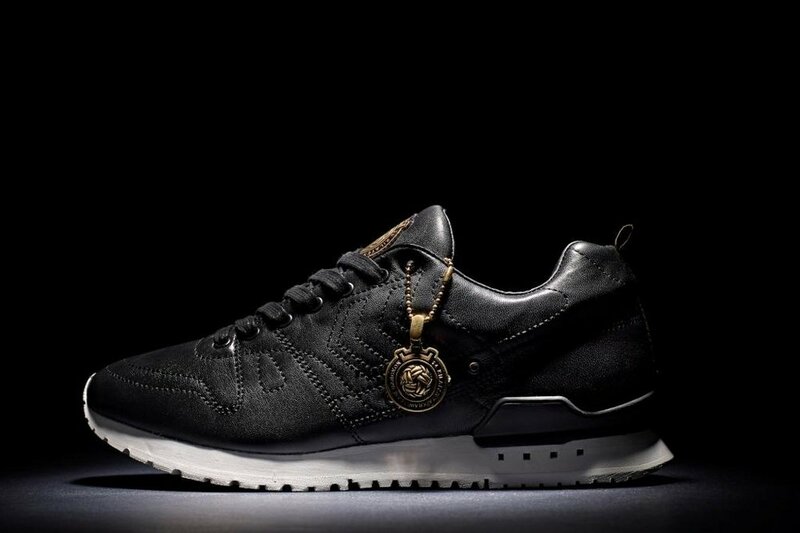 The Marathona sneaker is created with a premium one-piece lamb leather upper, tonal stitching, and a golden brass pendant produced in Thailand. It is sold with a leather-look shoebox with gold debossing. With metal eyelets and three different laces, the sneaker has the same details as seen on the jerseys and the shorts: golden chevron tape, a unique logo badge, and a gradient pattern in nuances of gold and black. The apparel features sublimation print in gold and a debossed drawing of Siam Indrajit – one of the most important protector giants of Thailand. As the face of Siam Indrajit is seen on the front of the jerseys, his neck and the back of his head is visible on the back. In honour of Thailand’s national Sepak takraw team that models these stunning designs in the dynamic collection video, the words Team Siam Indrajit is written in Thai on the sleeves of the jerseys. Also seen is the motto of the team; Giant Battle Ready. This premium collaboration is created in an exclusive limited edition drop with only 333 pieces of each design produced. The collection will be available on December 2 exclusively at 24 Kilates and in top-tier stores globally from December 7.